There’s no denying that there are a few rides that are better at Disneyland! Because sometimes, you just can’t beat an original. It’s not very often that I get to go to Disneyland. In fact, I think that in the almost eight years that I’ve known Chris I’ve only been four times. So when we were planning our Christmas trip out to California to visit family I requested that we go to the park and take our little one for his very first trip. Not only could his Nana go with us, but we could also see the differences between Disney World and Disneyland during the holiday’s. And I haven’t been able to do that since 2009! The fact that Walt built Disneyland on his own and that he walked through the castle is enough to make me fall in love with the park. He never had the chance to do that with Disney World, so automatically that makes DL just a tad more special (in my opinion). While WDW will always be my favorite, there are just a few things that Disneyland does better. I mean, you can’t argue with the original! They cram a lot of stuff into that park and a few of the changes they’ve made to some of the rides are just so much fun! Did you know that Disneyland also has special overlays on some of the rides during the holidays? That’s probably my favorite part of going to the parks over Christmas, because you are able to ride and entirely “new” themed ride for a few short months! And if you’ve never been to Disneyland during the holidays that reason alone is worth a trip. But enough about my love affair with all things Disney, let’s get on to the good stuff. Here are the five rides that are better at Disneyland! 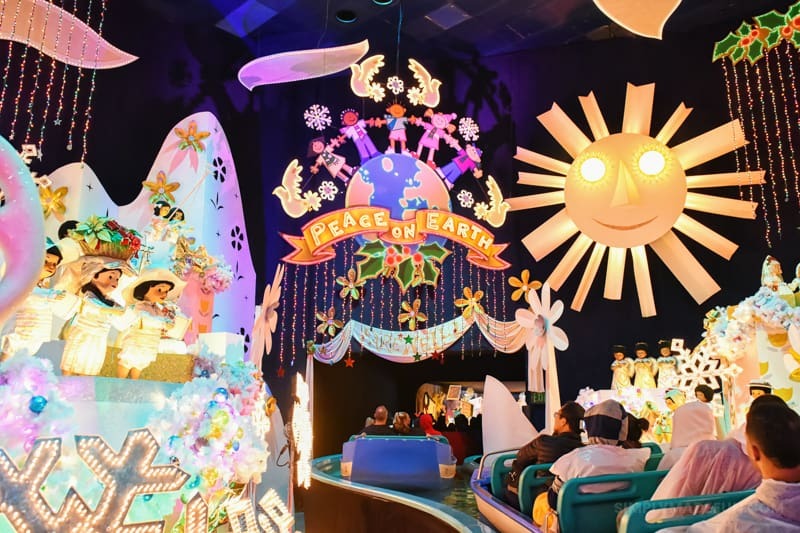 If you follow me on Instagram you may have read my post on not being a fan of It’s a Small World. I am just not a fan of creepy dolls starting at me as I slowly float past them. For 10 months out of the year I try my hardest to avoid going on it, but if we’re heading to Disneyland over Christmas I make an exception. Not only are the lights on the outside of the ride AMAZINGLY GORGEOUS once it gets dark out, the inside is just as cool. They even change up the song and sing Jingle Bells in all the different languages as you go through the rooms. But the best part of all? They have Disney characters hanging out with all the other dolls. That is something you don’t see at Disney World and I think that is a huge shame. I’m not quite sure how new this is but they did a complete overhaul of Space Mountain and it is now Star Wars themed. Chris and I were amazed at how awesome it is and I think my mouth hung open in awe the entire ride. You start off listening to the squadron talk to each other and then blast off into hyperspace to join the fight against the Empire. The theming was so great and is definitely a must-do if you are heading to Disneyland! We really wish they would do the same at the Magic Kingdom in Disney World. Not only is this ride longer than the one at the Magic Kingdom, it features more drops, different scenes, and a better story. You start off floating along the bayou and then quickly drop into Davy Jones locker. If you’re a fan of the movies you’ll notice where they took certain scenes from too! I know there are some people who love THM any time of the year but Chris and I generally don’t go on it. It’s not that we dislike it, but it’s one of those rides that we feel like if we’ve gone on it once it’s enough. 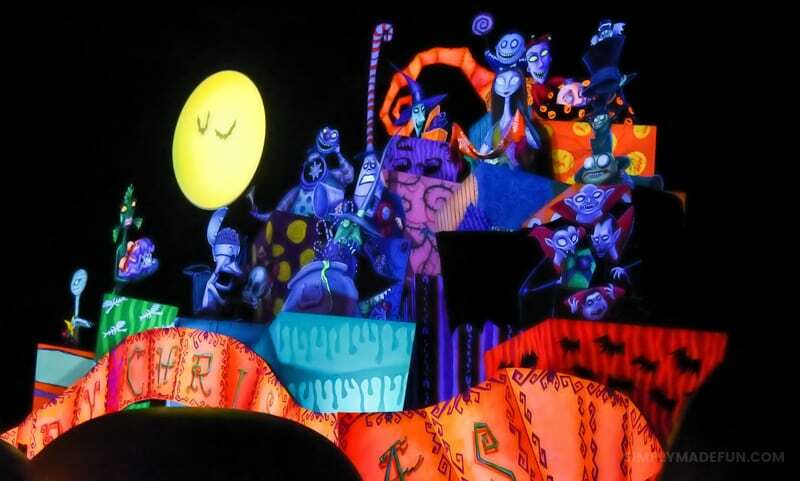 But during Christmas at Disneyland Jack Skellington takes over and it’s a complete Nightmare Before Christmas overhaul. I love listening to the music and seeing how Jack and Sandy Claus have decorated the mansion for the time of year. It’s also a lot of fun to see all the characters from the movie and where they incorporate them into the scenes! This is another ride we normally don’t go on at Disney World, but it’s mostly because the line is always really long and we never want to use a Fastpass on it. One of the main reasons it’s always worth going on at Disneyland is because some of the track is outside as you climb up the mountain. That may not seem like a big enough difference to make it worth it to some, but I really love looking out over the park from that vantage point. These are just a few of the rides that are better at Disneyland to us! Have you been to both parks? Which rides are must-do’s for you? 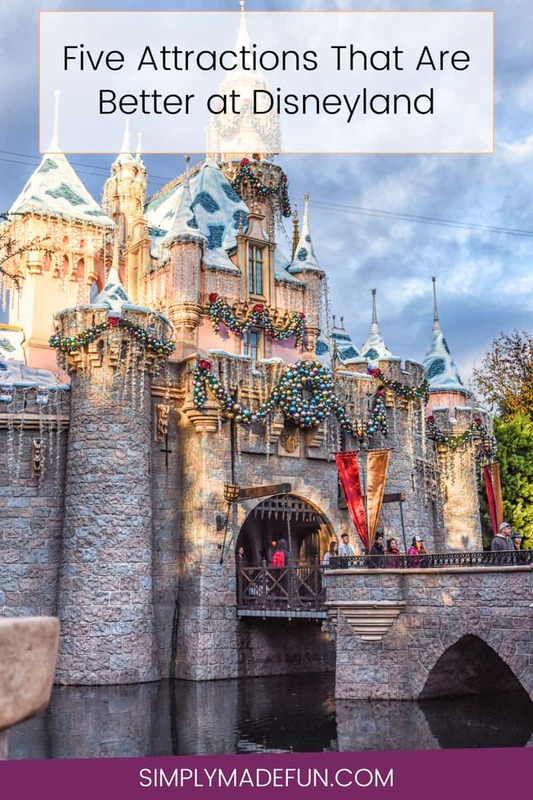 Get more Disney travel tips below!